Depstech USB-C Endoscope lifts the compatibility of endoscope to a higher level so as to better meet users' needs! Even if you're new to use endoscope, you'll be able to get the hang of operation quickly. Once installed the compatible APP, connect it with your device by using the corresponding adapter. With enhanced 8 adjustable LEDs on the camera tip, it greatly improves visibility in dark areas and allows you work much better. Armed with a bendable semi-rigid cable that can bend and hold it's shape for inspecting a wide variety of confined place. -For MacBook OS, please use "Photo Booth" "QuickTime Player" "VLC(VideoLan Client)". -How to Check OTG? You can install a free app "USB OTG Checker"which provides a simple method to check. 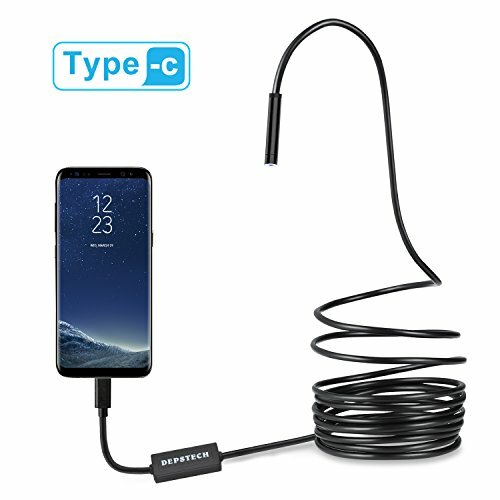 -This endoscope isn't compatible with iPhone IOS system, pls be aware of this before purchasing. At Depstech, we offer our customer with 1 year free warranty. Super Hi-Vision 2MP CMOS sensor camera, capture clear snapshot images and quality videos at a close range with resolution up to 1280 x 720. If you have any questions about this product by Depstech, contact us by completing and submitting the form below. If you are looking for a specif part number, please include it with your message.